The old Walnut Grove Presbyterian Church building was torn down. The arched windows were installed in the Foote Baptist Church building at Chestnut Square in McKinney. ORGANIZED IN 1846 BY THE REV. J. N.
ON THIS PROPERTY, DONATED BY D. M.
CRUTCHFIELD, WAS ERECTED IN 1869. 1886 AND REMODELED IN 1968. The congregation was discontinued shortly after obtaining the historical marker and the building was razed. Jon Ashly, Mrs. Mammie Ashly, Irene Ashly, John Lester Anderson, Mrs. Eliza Allen, Willie Mae Allen, Jack Allen, Roy Atkinson. B. B. Bryant, Mrs. Ella Bryant, H. H. Bryant, Mrs. Ellen Bryant, Eugene Bryant, Frank Bryant, W. M. Ball, Mrs. Elizabeth Ball, Paralee Ball, Josie Ball, W. J. Baxter, Mrs. Della Baxter, Robert Baxter, Carrie Baxter, Amanda Baxter, Erma Baxter, W. M. Brakebill, Mrs. Evilou Brakebill, Hunter Brakebill, Mrs. A. M. Brakebill, Pat Burgess, T. S. Barnes, Mrs. Nan Barnes, Warren Barnes, Emmet Barnes, Shelby Brown. T. H. Cunningham, Mrs. Lillian Cunningham, James Cunningham, Mrs. Lizzie Cunningham, Mrs. Annie Cunningham, Burkley Coleman, J. A. Crutcher, Mrs. Fannie Crutcher, Joe Crutcher, Mrs. Vergie Crutcher, Gilbert Crutcher, Mrs. Annieree Crutcher, Ethel Crutcher, Alice Crutcher, Myrtle Crutcher, Mrs. Pearl Crutcher, Eunie Cumby, Gertie Cline, Tennie Cline. H. I. Duncan, Mrs. Della Duncan, Mrs. Maggie Duncan, Dora Leigh Duncan, Nina May Duncan, J. W. Dowdy, Mrs. Lucy J. Dowdy, Clarence Dowdy, Oscar Dugan, Mrs. Maggie Dugan, Charlie Dugan, Mrs. Texie Dugan. R. H. Foster, Joe Foster, Mrs. Sallie Foster, Allie Foster, Sid Foster, Nola Foster, Hettie Foster, Mrs. A. Franklin, C. H. Free. F. M. Gifffin, Mrs. Callie Griffin, Evalena Griffin, Leona Griffin, A. M. Griffin, Mrs. Ethel Griffin, Marion Griffin, Rosalie Griffin, Mrs. G. W. Gwenn, A. D. Grace, Mrs. A. D. Grace, Delia Grace, E. J. Gaddy, Mrs. Maggie Gaddy, Mary Gaddy, Mrs. Tom Gentle, Allen Gaily. J. B. Hickey, Mrs. Cora Hickey, Norma Hickey, Fannie Hickey, Walter Hand, Mrs. Claudie Hand, Bessie Hand, Mrs. M. C. Harris, Miss Alta Harris, Miss Mytte E. Harris, Clouis Mack Harris, Lee Howard, Mrs. Ira Howard, Mrs. O. L. Howard, Dolph Howard, May Howard, Lola May Howard, Carrie Howard, F. M. Howard, Mrs. Alice Howard, Jarivs Hayes, Mrs. Molllie Hayes. Victor Irving, Mrs. Eula Irving. J. A. Jordon, Mrs. R. C. Jordon, Ollie Jordon, Charlie Jones, Mrs. Maude Jones, M. Jones. J. L. Kerr, Mrs. Ophelia Kerr, Miss Grace Kerr, James Kerr, Maria Kerr, Almanza Kerr, J . B. Kerr, Mrs. Rebecca Kerr, Sallie Kerr, Edwin Kerr, J. G. Kissinger, William Kissinger, Carl Kissinger, Jim Kissinger. Mrs. Lavina Lewis, Ben Lewis, Lawrence Lewis, Jim Lewis, Ed Lewis, Clint Lewis, Henry Lewis, Mrs. Amanda Lewis, Walter Lewis, Marion Frank Lewis, A. J. Leigh, Mrs. Lucy Leigh, Leslie Lewis, Mrs. M. D. Letsgo. Nora McCandliss, Claude McCandliss, Earl McCandliss. Mr. Nicolson, Mrs. Nicolson, Miss Nicolson, Mr. Nicolson, Jr., Alex Newman. Euna Proffit, George Payne, Mrs. Mary Payne, C. C. Payne, C. L. Payne, G. H. Payne, Mrs. Lula Payne. J. B. Rutherford, James Rutledge, J. M. Rainwater, Mrs. Bertha Rainwater, William Rouse, J. C. Rennick, Mrs. Rennick, Glen Rennick. Charles Snider, Mrs. Mary Snider, Harry Snider, Emma Snider, Earl Snider, Will Shultz, Mrs. Will Shultz, Mack Smith, Sam Smith, Mrs. Sallie Smith, Howard Smith, Walter Smith, R. T. Suelson. H. M. Talkington, Mrs. Mollie Talkington, Clifford Talkington, Clyde Talkington, Mrs. Lula Talkington, Will Talkington, Mrs. Mollie Talkington, Miss Maggie Talkington, Troy Talkington, Myrtle Talkington, Willie Meda Talkington, Ruby Talkington, Mattie Talkington, Tom Talkington, James Thomas, Mrs. Nannie Thomas, Mrs. Thompson, Mrs. Aleria Thompson. W. A. Uselton, Mrs. M. E. Uselton. G. M. D. Williams, Mrs. Sarah Williams, Walter E. Williams, Mrs. Laura Williams, Miss Elsie Williams, Luther Williams, Jewett Williams, Roy Williams, Charlie Wright, Mrs. Mary Wright, J. W. Washburn, Raimond Wilson. The early settlers in the neighborhood were a Christian people and recognizing the necessity of having a place for religious services and for educating their children had united their labors and contributions and built on a pretty flat near a spring a log house about 18 by 20 feet. This was the only public place in the community and for several miles around where children went to school and the gospel was preached. The builders before putting on the rafters and roof had failed to tie the plates with girders, spreading, the roof settled down in the middle and the house became known as Old Sway Back, not a very euphonious name, but, never spoken in opprobrium, for many a person went from its sacred precincts happier and better because of the new life in Christ Jesus, which had come into their soul. What is now known as the Walnut Grove Congregation of the Presbyterian Church, U S. A., was then the United Congregation of the Cumberland Presbyterian Church, if I should, indeed, be justified in speaking of it as a local organization, at all. At that time it was more on the order of a floating Tabernacle, so to speak. The Elders were widely separated in point of habitation and did not get together in a session meeting sometimes but once a year. As I now remember, my mother, brother John and myself were admitted to membership in the congregation on the 13th day of October, 1855. We were admitted by letter from Oak Grove Congregation Hiwassee Presbyterian East Tennessee Synod of the Cumberland Presbyterian Church on date above named, the first opportunity after our arrival in the community. My brother, W. A. Rhea, was admitted to membership by letter as above, as a Ruling Elder but date not remembered. The Elders of the congregation at the time of which I write were Judge Harrison Jamison; Benj. Hodge and Caleb Hart. Rev. W. B. Wear, a Cumberland Presbyterian emigrated from the state of Missouri, probably in the year 1852 and settled in the neighborhood not far from where the church house now stands. He was one of Natures noblemen, a Christian gentleman and a fine preacher and was regarded as the father and founder of Cumberland Presbyterianism in the locality. He was one of those sweet spirited, persuasive preachers that appeals to the best that was in a person, and was instrumental in the hands of God in bringing many into the Master's fold. An important event that took place in the congregation in the spring of' 1858 was the meeting of White Rock Presbytery. Sway Back was inadequate to the occasion and the people of the community turned out and cleared up the grounds and built an arbor in an elm grove in the southeast corner of Elder T. H. Cunningham's field across the creek from the church, and there meetings of the body were held. The Presbytery embraced a large territory and quite a number of ministers and elders were present. Among the ministers in attendance were Rev. A. J. McGee; Rev. John Tate, who had lately come to Texas from our old Presbytery in Tennessee, an old acquaintance and it was a pleasure to meet and entertain them. Rev. W. B. Wear, Jr., who had been under the care of Presbytery for some time was ordained to the full work of the ministry. It was my first time to be present on such an occasion, I remember it, to this day, as a very solemn and impressive service. Soon after this meeting, arrangements were made for building a church house. My father was made chairman of the building committee, and if my memory serves me correctly, the house was built and closed in; as it was correctly called, not later than the summer of 1859. The house was 30 by 32 feet. Soon the house was ready for occupancy, Rev. Wick Smith was called to the pastoral charge of the church. 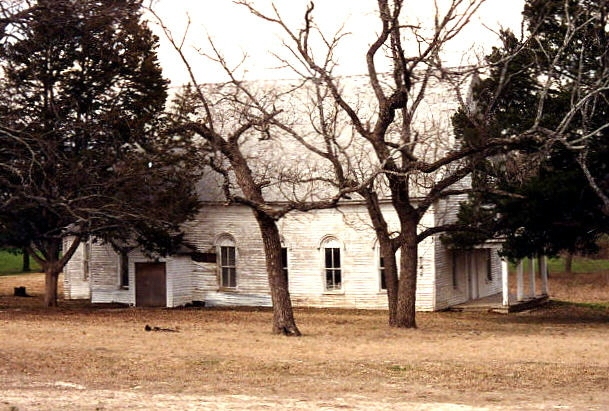 He and his family had emigrated to Texas from Middle Tennessee, probably in the fall of 1854 and at somewhat later date bought a farm above 3/4 miles southwest of the church. Brother Smith was a very social man, commanding in his appearance, pleasant and interesting in his address and a fine preacher. He remained in charge of the congregation till some time during the war, when he moved to Grayson, near Pilot Grove. So far as I can remember, there was no pastor in charge of the church at the time of my home-coming in June 1865, [He evidently meant his return from the Civil War]. The first pastor of which I have any account after the above date is that of Rev. T. J. Malone who came from Kentucky to Texas at an early date and settled in the northern portion of Dallas County. His pastorate began in 1867 and continued till the fall of 1870. e was a man of ability and companionable and entertaining in the family circle and was esteemed a most profound theologian of the Presbytery. Rev. P. W. Renison, a local young minister, was employed to fill up the time until the church could procure another pastor. Rev. S. M. Wilkins, another one of the early fathers of the church in Texas was called and he was pastor in the fall of 1870, October, and continued till the close of 1871. During his pastorate the church was enlarged, reseated and finished at a cost of $1000.00. Rev. R. F. Jones of Grayson succeeded to the pastorate in January 1872 and continued till the close of 1873. Rev. C. N. Jarrell was called to the pastorate in the spring of 1874 and continued till the close of 1877. Rev. E. C. Gillenwater of Sherman was called for two Sabbaths in the month in January 1878 and continued through the year. Rev. W. P. Cloyd of McKinney was called to the church in January 1879 and remained with the church till the close of 1882. At the beginning of 1881, Rev. C. N. Jarrell was called to the church and continued till the close of l884, except for a short time during the later summer when Rev. S. R. Chaddicel filled the pulpit during a vacation kindly extended Bro. Jarrell. Rev. W. P. CIoyd was again, called to the church in January 1885 and continued his pastorate until May 1886. In August 1885, Rev. C. B. Hodges with his big tent held a camp meeting of two weeks on the church ground. He was a noted evangelist and a pioneer in the big tent camp meeting line. Many tenters were on the ground and large congregations were in attendance on all the services. The meeting was a great season of refreshing from the Lord, for his people and 24 converts were the visible results from the ranks of the unsaved. A purse of $150.00 was made up for Bro. Hodges and presented from a loving and appreciative people. The present church was completed early in 1886 at a cost of $1,425.00. There are some other things that I would like to speak of, especially of the young men that were called to the ministry and took up the work of the ministry from the Walnut Grove Congregation. They were well remembered by the community and their work too well known to need special mention at this time. Dedicated Big Tabernacle Sunday for its Annual Camp-Meeting. Established in 1851-Membership About 320 at Present-Brief Historical Sketch. Walnut Grove Cumberland Presbyterian church, which dedicated its big tabernacle Sunday, has the distinction of being the only country church in Collin county to employ a pastor exclusively for its own service. It is located nearly ten miles slightly northwest of McKinney, at a site in a beautiful grove of walnut trees on the bank of Wilson creek. It is said to be the most desirable spot for campmeetings to be found in the county, having an abundance of shade and plenty of water at hand for both man and beast. Its annual campmeetings held in August have become features of more than ordinary interest in the religious annals of the county. Hundreds attend them every year, many erecting tents on the grounds and remaining day and night throughout the meetings. Prior to this year, services for these meetings have always been held under a brush arbor, in order to accommodate the crowds which could not get into the house. In rainy weather this was unsatisfactory and often interrupted the meetings. To remedy this, the present splendid new tabernacle, of spacious dimensions, was built just in the rear of the church building. It was dedicated Sunday afternoon entirely free from debt. This church is one of the oldest organizations of any denomination in Collin county. It was organized in 1861. For nine years the membership had no house of worship but held services in the grove in favorable weather and around in private residences. The first church edifice was erected in 1860, enlarged and remodeled in 1871. The present structure was built in 1885 during the pastorate of Rev. W. P. Cloyd of this city, who served the congregation twelve or fourteen years as pastor. The following is a list of its pastors: T. J. Malone, P. W. Renison and S. M. Wilkins, all deceased; R. F. Jones, now of Whitewright, C. N. Jarrell, now of Parvin; E. C. Gillenwatters; W. P. Cloyd, now of McKinney; S. R. Chaddick, of Gilmer; B. L. Hunter, of Valley View; R. C. Grace, of Wagoner, I. T. ; J. A. Hornbeak, of Kearnes, Tex., and J. H. Bone, present incumbent. The present membership is about 320 and present session is composed of Capt. W. A. Rhea, J. B. Kerr, Mack Smith, J. L. Kerr, and J. T. Coleman. J. L. Kerr is superintendent of a thriving Sunday school that is also conducted in the house. Walnut Grove also has one of the oldest burying grounds in the county. The dust of many of Collin's earliest pioneers sleep in the silent, but well kept city of the dead on the hill overlooking the grove in which the church and tabernacle stand.